A DIFFICULT YEAR for Eoin Larkin had a happy ending on Sunday when he helped Kilkenny to retain their All-Ireland senior hurling title at the expense of Galway. The 1-22 to 1-18 victory at Croke Park gave Larkin his ninth All-Ireland medal, but the veteran forward has admitted that he was on the verge of quitting earlier in the year. Larkin’s season began with surgery on a groin injury, followed by a bout of glandular fever. His subsequent absences from the panel left the 31-year-old disillusioned. “I was close, to be honest. There’s no point in saying I wasn’t,” Larkin said, when asked if his injury troubles in 2015 left him considering his future as a Kilkenny hurler. Two weeks before the All-Ireland final, while Kilkenny were in Fota Island for a training weekend, injury struck again. This time it was a broken thumb. The culprit? The injury led to a stressful build-up to the clash with Galway for Larkin. He spent nine days in a cast, which was only removed on the Tuesday before the game. Nevertheless, the James Stephens clubman played all 70 minutes and chipped in with 0-2. “It was [stressful] and it could have affected me, but from the time I got the injury I wanted to try and focus and get fit and play in the All-Ireland final,” Larkin said. Larkin, who’s part of the Irish Defence Forces, departs for a peacekeeping mission to Syria next month and he won’t return until early April. 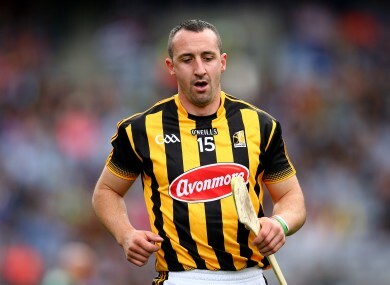 What does that mean for his place on the Kilkenny panel in 2016? Email “'I was close' - Eoin Larkin considered calling it quits earlier this year”. Feedback on “'I was close' - Eoin Larkin considered calling it quits earlier this year”.